French, British and Dutch rescuers rushed aid to a string of Caribbean islands Thursday after Hurricane Irma left at least a dozen dead and thousands homeless as it traced a course that could lead to a catastrophic strike on Florida this weekend. Hurricane Irma started "pummelling" the Turks and Caicos islands Thursday evening with sustained winds of 280 km/h, the National Hurricane Center said. Earlier in the day, French, British and Dutch rescuers rushed aid to a string of Caribbean islands devastated by the hurricane, which left at least 12 dead and thousands homeless. Warships and military planes were dispatched to the stricken zone with food, water and troops after the fearsome Category 5 storm smashed homes, schools and roads. 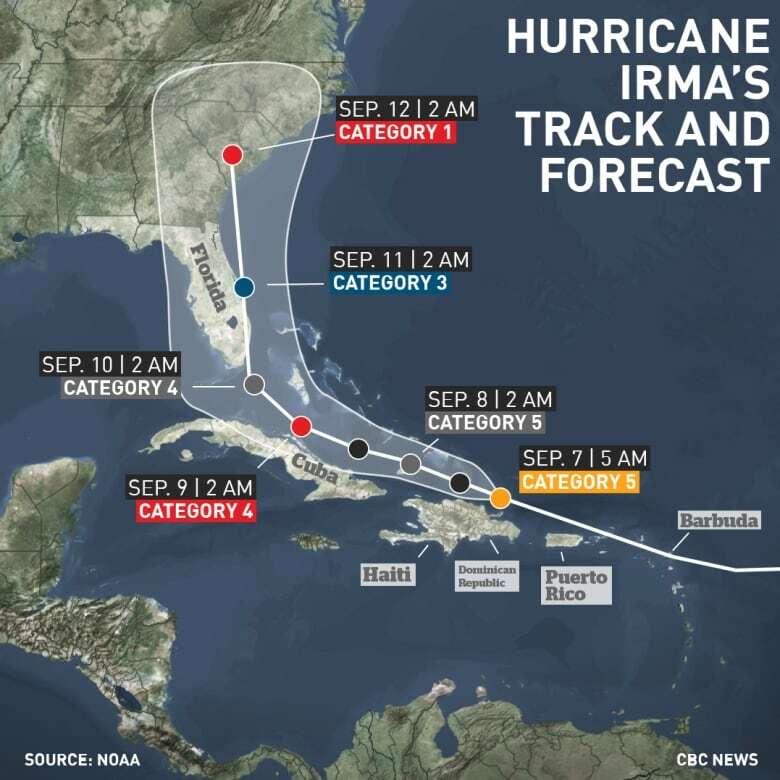 Hundreds of kilometres to the northwest, Florida braced for the onslaught, with forecasters warning Irma could slam headlong into the Miami metropolitan area of six million people, punish the entire length of the state's Atlantic coast and push on into Georgia and South Carolina. Officials issued mandatory evacuation orders for tens of thousands of people in the Florida Keys and in exposed or low-lying parts of the Miami-Fort Lauderdale area as Irma closed in with winds of 280 km/h. The hurricane centre said Irma will move toward the Bahamas this evening and then closer to the north coast of Cuba in the next day or so. As the storm arrived in Turks and Caicos, Gov. John Freeman told CBC News the wind was a making "tremendous noise," tearing off roofs and tossing cars, but the extent of the damage wouldn't be known until Irma passes. "These very beautiful islands, which many Canadians come to each year to holiday, are very low lying, they are vulnerable," Freeman said. "We have to look at not just the wind speed, but the sea surge, and the sea surge will produce inundation and flooding." Freeman said many people had flown out of the country before Irma hit, but some tourists chose to stay at hotels. "They've been built knowing the hurricane challenges, and we would hope and expect within those hotels, they should be safe," he said. 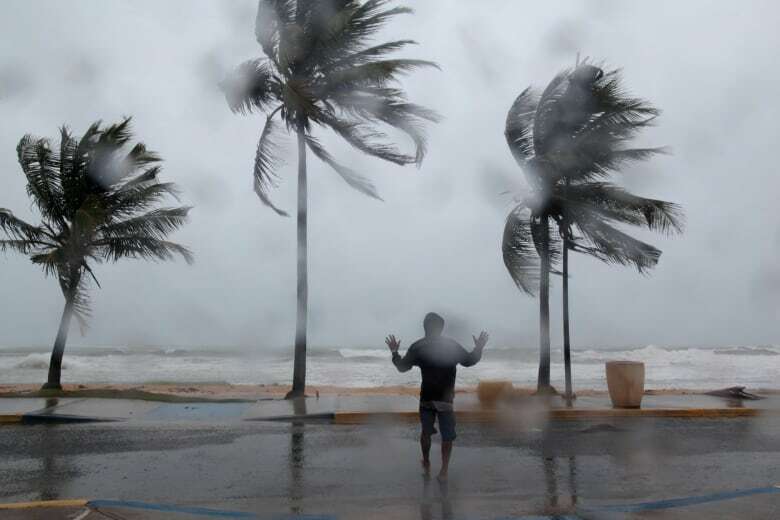 French Interior Minister Gerard Collomb told Franc Info that eight people died and another 23 were injured in the French Caribbean island territories of St. Martin and St. Barthélemy, which felt the full force of the storm early Wednesday. That number is expected to rise. 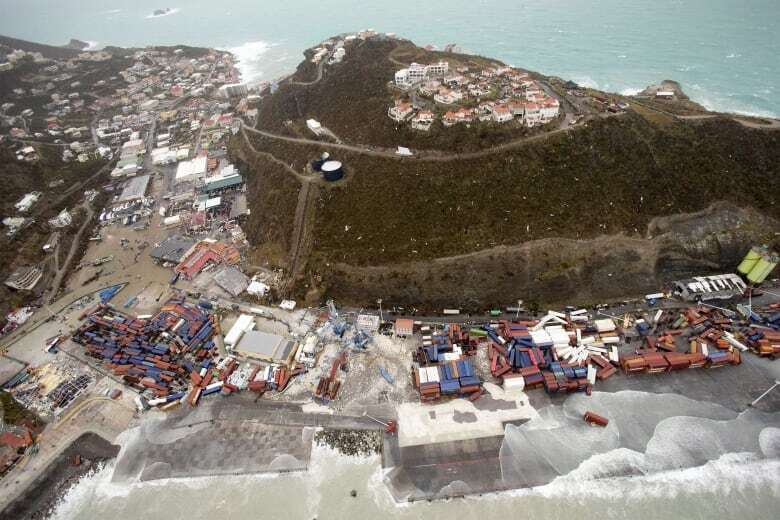 The southern half of the island — which is Dutch territory, known as St. Maarten — also suffered "enormous damage," according to the Dutch Royal Navy. The navy tweeted images gathered by helicopter of damaged houses, hotels and boats. The airport was unreachable, it said. The Interior Ministry confirmed one death on St. Maarten. 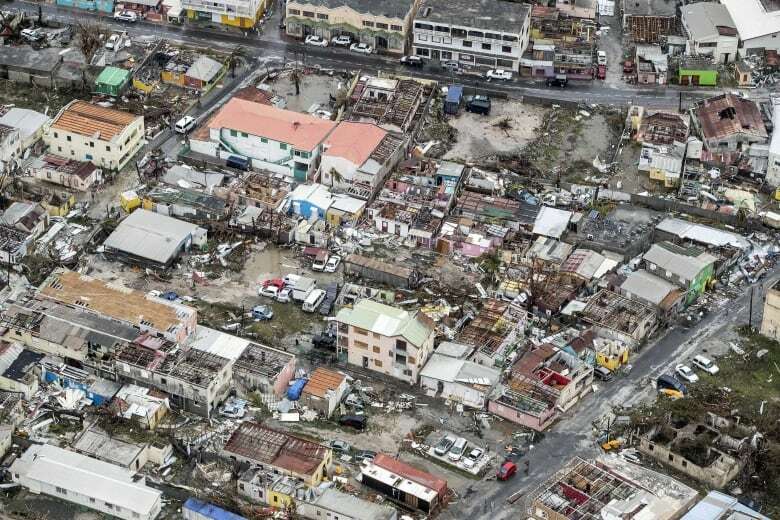 Authorities say at least one person has died in the northeast Caribbean island of Anguilla, said the Caribbean Disaster Management Agency early Thursday. The agency also said 90 per cent of roads in Anguilla are impassible. On Wednesday, a two-year-old child was killed as a family tried to escape their home during the chaos. Officials have also confirmed four deaths in the U.S. Virgin Islands said they expect to find more bodies. Collomb said 100,000 food rations were sent to St. Barts and St. Martin, the equivalent of four days of supplies. "It's a tragedy; we'll need to rebuild both islands," he said. "Most of the schools have been destroyed." "There is no power, no gasoline, no running water. Houses are underwater, cars are floating through the streets, inhabitants are sitting in the dark, in ruined houses and are cut off from the outside world," he said. A Dutch navy ship arrived in St. Martin with vital supplies. And two Dutch military aircraft were being sent the island of Curacao and on to St. Martin to deliver food and water intended to last the population of 40,000 five days. The aircraft were carrying 100 extra troops to deliver aid, repair infrastructure and restore order. On Barbuda, nearly every building was damaged when the hurricane's core crossed almost directly over the island early Wednesday. 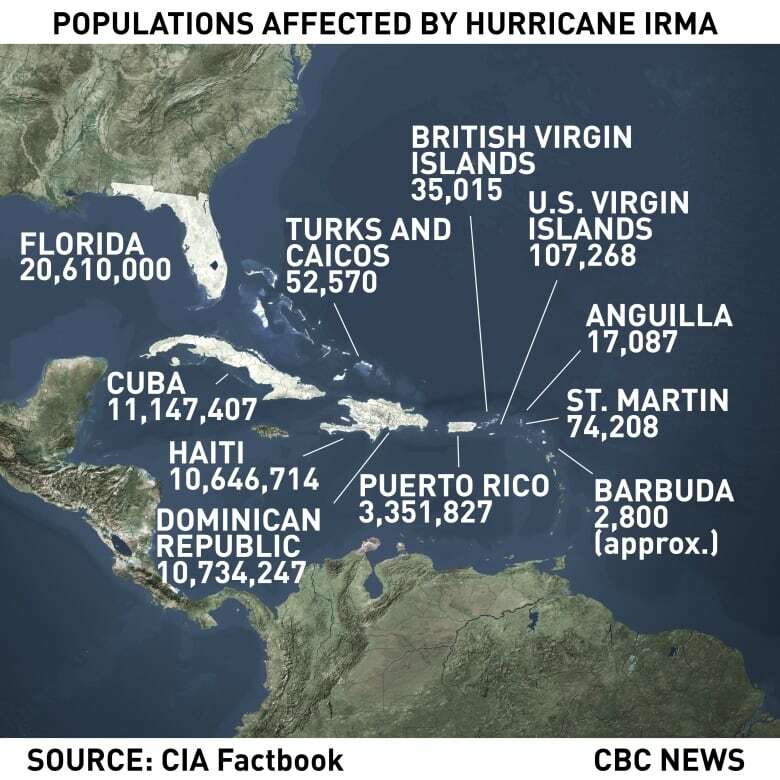 About 60 per cent of its roughly 1,400 residents were left homeless, Antigua and Barbuda Prime Minister Gaston Browne told The Associated Press. He said roads and telecommunications systems were wrecked and recovery would take months, if not years. On St. Thomas in the nearby U.S. Virgin Islands, Laura Strickling spent 12 hours hunkered down with her husband and one-year-old daughter in a boarded-up basement apartment with no power as the storm raged outside. They emerged to find the lush island in tatters. Many of their neighbours' homes were damaged and once-dense vegetation was largely gone. Authorities described the damage as catastrophic and said crews were struggling to reopen roads and restore power. President Donald Trump approved an emergency declaration for the U.S. Virgin Islands and Puerto Rico, allowing federal agencies to step in and provide aid. Some islands in the region will soon be hit with a second hurricane, according to the NHC. Jose became a Category 3 hurricane Thursday afternoon while moving in from the mid-Atlantic. It started the day as a Category 1 storm. The hurricane centre said Jose is now the third major hurricane for the 2017 Atlantic hurricane season. Jose is expected to gain more strength by the time it hits on Saturday, striking islands including Anguilla, Antigua and Barbuda. A third hurricane, Katia, is currently stalled over the Gulf of Mexico but is expected to move southwest toward the coast. It is a Category 1 storm but is also expected to grow into a major hurricane by the time it makes landfall late Friday or early Saturday.